Quick-Change Tooling—Split dovetail slide mountings—make tool changes from punching to bending in less than one minute. Automatic Urethane Hold-Downs—This unique Piranha ironworker feature, coupled with a low rake angle, keeps parts from deforming or shifting during the shearing process. The hold-downs work automatically, eliminating the need for time-consuming adjustments between cuts. The Piranha Model P-90 picks up where the P-65 ironworker machine leaves off – for applications requiring more tonnage. 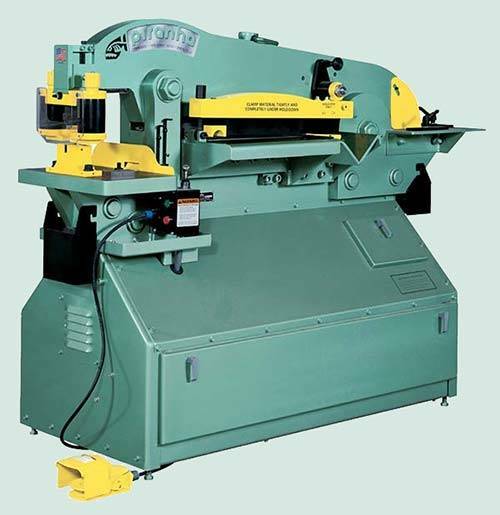 It is midway in our line of hydraulic ironworker machines which includes P-50, P-65, P-90, P-110, and P-140 single-operator ironworkers, and PII-88 and PII-140 dual-operator ironworker machines. The P-90 hydraulic ironworker machine has more standard workstations than any other ironworker in its class. This includes punching, bending, bar shear, angle shear, round bar shear, and an integrated coper/notcher. The P-90 has full electrical control of its stroke with a footswitch and limit switch stroke controls. The no slug-loss shearing saves material, keeps the machine area cleaner, and offers larger material capacity than the competition. A wide variety of optional tooling is available to enhance the P-90’s capabilities. Piranha’s incomparable integrated coper/notcher station outperforms any other ironworker machine. Notch from thick to thin, remove the full leg from angle iron, shave even the smallest piece from the end of the work piece, and maintain total control of the part – from any angle. When comparing hydraulic ironworker machines, look at the complete package. 1/2″ x 18″ Motor Std. 230/460 3 Ph.